Alzheimer as one of the most prevalent types of dementia involves about 1.73% of Swiss population according to Alzheimer Europe. 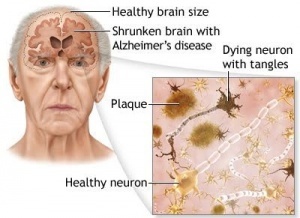 Although the origin of this neurodegenerative disease is still under strong debate but one of the important hallmarks of the disease pathogenesis is the aggregation of Amyloid Beta (ABeta) plaques in the brain extracellular space (ECS). Since ABeta is one of the naturally produced peptides in the brain, it is hypothesized that in the diseased condition the mismatch of the production and clearance of this protein results in the demonstrated plaques deposition. The normal physiological clearance mechanisms for ABeta includes uptake by microglia (degeneration), absorption to the blood stream and transport to the pool of cerebrospinal fluid (CSF) filling the brain ventricles and subarachnoid space (SAS). Recent in vivo tracer studies revealed the rapid transport of the larger particles in the brain via paravascular space network which covers the whole parenchyma and connects to the bath of CSF in the SAS. Our computational fluid dynamics model indicated how the arterial wall pulsations could enhance the transport of the large particles in the PVS. According to the Amyloid hypothesis, malfunctioning of one of the above mentioned amyloid clearance pathways leads to Alzheimer. However, unless the relative significance of these clearance mechanisms is clarified well, it is difficult to leave a strong comment on the authentic origin of the amyloid deposition. Therefore, developing a computational model which represents the cycle of ABeta from the production to the clearance in the parenchyma based on the bio-physical principles could be a big step towards quantification of the whole process. This physiological model could provide a good working tool to investigate the plausibility of several available hypotheses developed for Alzheimer pathogenesis. The Master student interested in this project should be willing to do research in a multidisciplinary field and environment. The student needs to know from the background about computational fluid dynamics methods (CFD) and will implement the model in one of the well-known CFD platforms (Star-CCM+, Ansys Fluent, OpenFoam, or …). The estimated duration of the project is 6 months. For detailed information, please contact either Mahdi Asgari (PhD student), mahdi.asgari@uzh.ch, +41 44 635 5056, or Prof. Vartan Kurtcuoglu, vartan.kurtcuoglu@uzh.ch, +41 44 635 5055.